As part of the exhibition, the Siemens Poster Vote seeks to find out what your favourite poster is. Is it this one? Let us know by voting now! This week’s poster, Extension of the Piccadilly Line to Heathrow by Tom Eckersley, commemorates an important milestone in the history of the Tube. On Dec 16th, 1977 the Heathrow extension was opened by HRH Queen Elizabeth II with the words “I now have great pleasure in declaring the extension formally open and wishing success to those who will manage the line and those who will travel on it.” She followed in the footsteps of her great-grandfather Edward the VII (HRH The Prince of Wales at the time) who opened the Central Line “tuppenny tube” in 1890, called this because of its flat two-penny fare regardless of destination. The Heathrow Extension offered direct access to the international airport from central London in just 40 minutes and for just 80p. It was the cheapest, quickest, and most direct way to reach the airport, beating out a £1 bus shuttle and £5.10 taxi ride. Prior to the extension, travelers who took the Tube would take a shuttle bus from Hatton Cross direct to the airport tarmac. The new extension, which was in the works for over 30 years, helped to liberate Londoners with quick and easy access to international travel via the new Heathrow Central Station. Eckersley’s poster was in use on the network from 1971 to promote the project, and its style set the tone for the look and feel of the extension. It is crisp and colourful, sleek and chic, and cleverly shows the Roundel supporting the graphic of the Tube line extension. The Heathrow Extension and the new station, in the middle of the airport complex, was the height of technological and design innovation. The new Tube trains featured the popular ‘Straub’ moquette. Designed by Marianne Straub, a contemporary textile designer and member of the well-known artist community of Great Bardfield in Essex, which also included the illustrators Edward Bawden and Eric Ravilious, this moquette was sharp and chic in blues and greens and was extremely popular with the public and widely used on the transport network. The new Heathrow Central Station also featured a mural from Eckersley, which refined the design of an airplane to a sleek and simple four-colour graphic. 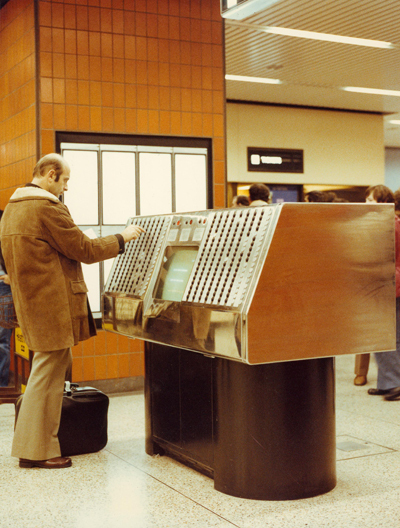 There was a new, and quite imposing, automatic ticket machine in the station, which employed early computer technology to allow travelers to book their own journey without having to go to the ticket office. The station also featured new moving payments, aptly named “travelators” and computer assistance for underground routes in several languages. The extension was a great success, but innovation hasn’t stopped there as travelers are always looking for faster and better ways to get to their destination. In 1988 Heathrow Express opened with a new and improved solution, traveling from Paddington Station to Heathrow in just 15 minutes. A key part of this service is the top fleet of Heathrow Express trains, kept in top shape by Siemens, which is responsible for 24 hours a day, 365 days per year full-maintenance service of the fleet including overhaul and refurbishment. The 16,000 passengers travelling each day on Heathrow Express journeys are now assured of a premium travel experience, thanks to the recent completion of a £16million, 20-month project of fleet transformation by Heathrow Express in partnership with Siemens and Railcare. The Heathrow Express has carried over 60 million people since 1988 and in the last decade, its energy-efficient trains have saved enough energy to boil 400 million kettles. Tom Eckersley’s work helped to define the style of London Transport, designing posters, station decoration, and graphics for timetables, events, and on-board information signage for buses and tube trains for an astonishing 60 years (1935-1995). His work was quite prolific and helped shape the style of the times. In addition to the vast amounts of work he did for London Transport he also worked other public and private agencies including BBC, Shell, the Ministry of Information, and the General Post Office. He is perhaps best know for his bright and colourful tile designs that decorate the platforms along the Victoria Line which Londoners still love today. The poster Extension of the Piccadilly Line to Heathrow by Tom Eckersley is particularly appealing and has been a favorite for many years with audiences. It has been consistently in print and a top request in the London Transport Museum Shop. Have you voted for your favourite poster yet?